Neo Technology erect commercial buildings and private houses in Namibia. 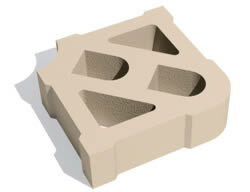 Terraforce Namibian licensee for Terracrete wet cast blocks. To be most effective, economic and ecologic we are using modern and established knowledge and materials. For cost effective and fast building we are producing latest brick technology based on the South African Stumbelblock patent. For individual jobs we provide skilled teams for plumbing, electric, air condition, tiling, painting, ceilings, roofs, all kinds of building and shop fitting.